For Ro, I’ll post about my bbq beef brisket in the crock pot experiment. 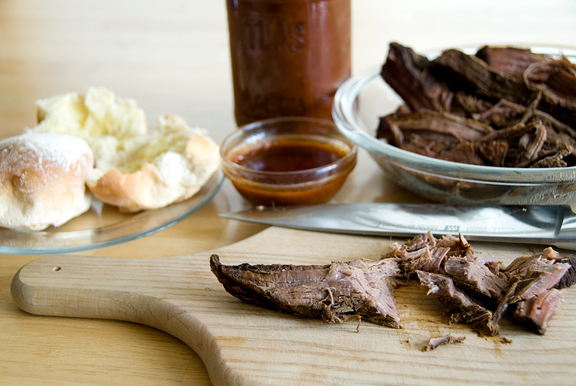 Typically bbq beef brisket is slow cooked/smoked over coals for 10-12 hours. I have no interest in keeping an eye on something that could burn my house and my neighborhood down for that long, so I had the choice between the oven and the crock pot. Oven is out of the question with the latest heat wave, and the winner is: crock pot. I picked up a 2.5 pound beef brisket, which ended up being about a half pound of fat. Clever little butchers wrap the meat up so you can’t see the fat… You’ll want to remove as much fat as possible, which is a tedious, but sort of fun task. At least I take a sort of OCD pleasure in doing so with my very very sharp knife. 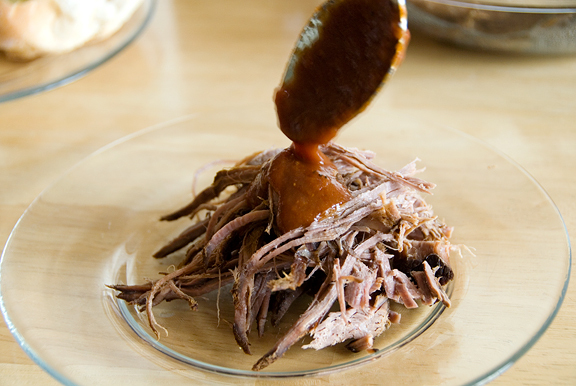 Once the brisket is ready, pop it into the crock pot. You can cut it up if the shape results in appendages protruding unceremoniously above the liquid. What liquid? I’m getting to that. I found a recipe that calls for a cup of water, 1/4 cup Worcestershire, a tbsp of vinegar, 1/2 tsp chili powder, 1/4 tsp ground cayenne, 1 tbsp brown (or any) mustard, 2 minced cloves of garlic, 1 cube of beef bouillon (I use a bouillon paste). Mix all of that together and toss it into the crock pot. Add more water to cover the brisket. I set it on high for 5 hours. At 5 hours, it was still pretty cohesive, so I set it for 6 more hours on low. By morning, it was at easy pull apart, although I suspect if I let it go another 3 hours, I could have had it falling apart – dunno. Ro’s question was how to serve brisket. When I’ve had the Best Beef Brisket Ever, we always sliced it up and ate it with bbq sauce and all of the other delicious sides from Hogly Wogly’s. 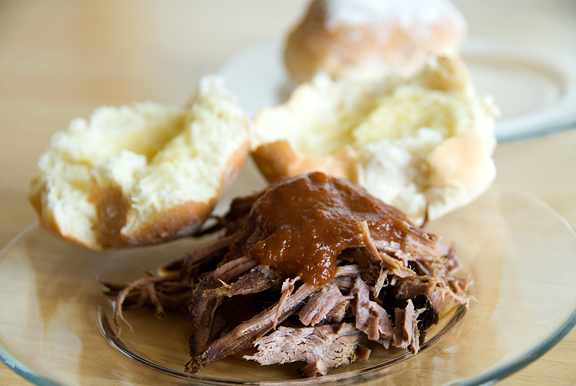 But I actually like brisket pulled, whether it is served as is with some bbq sauce (here I use more of the Mutha Sauce from my Dinosaur Barbecue cookbook) or on bread. Actually, I require bread with bbq. However, the title of Domestic Goddess cannot be bestowed without the following recipe in one’s arsenal: Roast Chicken. Talk about bang for the buck, so to speak. This is incredibly easy and incredibly delicious. For people who embrace leftovers and like to plan, you can double the recipe (that means roast TWO birds). Pat the chicken dry and remove the neck and giblets (reserve for later). Grate zest of lemon into a bowl. Combine with 1 tbsp salt and black pepper (and optional herbs). Rub the mixture over the chicken and inside the cavity. Be sure to get under the skin of the breast and rub some of the seasoning there. Cut the lemon in half and stuff half of it in the cavity. Set chicken on a wire rack on a plate or sheet and refrigerate uncovered for at least 4 hours and up to 24 hours. A half hour before you are ready to roast, remove the chicken from the refrigerator, set the oven rack to middle, and preheat to 425F (higher if at elevation). Brush melted butter over the skin and sprinkle with 1/2 tsp of salt. Truss the bird and set it breast side up on a rack in a roasting pan. (If you have vegetables to roast, you can toss them with some salt, pepper, a little olive oil, and chuck them in the bottom of the pan). Roast until breast is nicely browned, about 40 minutes. Then remove from oven and flip the bird over and continue to roast until thickest part of thigh registers 165-170F (about 20 minutes more). Let rest for 5 minutes before carving. *Note: If you save the carcass and other bones, you can dump them in a pot of water with the reserved neck and giblets to make chicken broth.